“Death by committee” describes the slow, painful death of an idea, initiative or project from the stifling effects of the bureaucratic process. It’s death by suffocation from too much well-intentioned attention. It’s also a death we’ve witnessed firsthand on more than one occasion. Whether it’s a non-profit organization, a municipal agency, or for-profit company, there is usually a group of executives or board members who need to see and approve the work we do. After all, a website or marketing program is the voice of the organization at large. Working with a committee or a board — or even a team of executives — can be painful and challenging, both politically and intellectually. The good news is that with the proper approach and tempered tenacity, we can keep your initiatives on the rails and moving forward. 1. Understand the overall goals of the board. The outcome or deliverable of our work together is not always the long-term goal of the board. How do you avoid this? You need to get the lay of the land. What problems is your digital agency pulled in to solve? A new shiny website isn’t usually the end-game. There’s always something under the surface. Make sure everything you have planned, from the actual project assets right down to the way ideas are presented and work is prioritized, aligns with their vision and addresses their true grievances. Don’t wait until you have a full homepage mockup or a marketing strategy to share with the board. Bring the board in early, and get their buy-in to the high-level approach of the project or program. Work with your content or marketing strategist to put together a list of goals you’re going to achieve, and the myriad ways you’re going to try to tackle them. That includes an approach to voice and tone, some design and aesthetic mood boards, and perhaps some ideas of campaign elements. Your digital agency should be able to create whatever you need to be able to present the problems and proposed solutions without getting too specific. 3. Make sure everyone knows the timeline. A good agency’s production schedule works like a well-oiled machine, but unexpected directions can throw a wrench in the gears. Work with your board and your digital agency to establish exact milestones and deliverables that the board needs to see and approve prior to starting the project. If the project plan changes, reconfirm the production schedule with the board rather than surprising them with either more or less than they’re expecting. Share and re-confirm the agreed timeline throughout the project lifecycle. When someone starts to stray too far, ask if this new direction is worthy of the time (and money!) it may cost your organization. 4. Bring your agency to the table. You don’t have to go it alone — that’s why you hired a digital agency! You should never be presenting strategic approach or design solo. Having experts by your side when you’re showing the work helps fortify the position and allows the agency to show their thinking. When you plan your milestones and meetings, be sure to give the agency a seat at the table. Our job is to make you look good, and to sell the decisions we’ve made together along the way. Let us do our job. If you’ve done your job, you’ve already sold the higher-level goals of the project to the board so now, we’re just presenting the tools that will get the job done. But that doesn’t mean that everyone (and their mothers) won’t have an opinion to share. You’re going to hear, “I don’t like that color” or “The woman in that photo is too clinical” or “I can’t stand vertical lines.” Steer the conversation away from likes and dislikes, which are subjective, to whether or not the design or content fulfills the overall goals of the project. Remember #4? Your digital agency likely did a good deal of research to learn about the preferences of your target clients or customers, about your industry, and about your brand. Bring them to the table so they can discuss their findings and creative decisions. Just like in a 12-step program, having a sponsor will greatly increase your chances of success. Identify an executive or board member who understands the role the project plays in the grand scheme, and make him or her your best friend. Ask if you can share details and decision-making throughout the process. A sponsor makes sure that the project’s goals are aligned with overall company strategy, garners support (and overcomes resistance) from other senior executives, and provides ongoing direction as the effort unfolds. Call on them for support and input even if you don’t think you need it. Our job is to make you look good, and to sell the decisions we’ve made together along the way. 7. Prepare for the voice in the shadows. There is always one voice in your organization, on your board or your committee, that has just a little more sway than the others. This might be the CEO, or the chairman, or even just someone that is well-respected. They may not always be available for the milestone approval meetings throughout the process of the project lifespan, so you need to be prepared to answer to someone who hasn’t been privy to groundwork you’ve expertly laid with the rest of the group. Make sure you have a clear demonstration of why you’ve arrived at the place you’re at. Take a deep breath, and let go of the ownership you feel over the work itself. You are going to win some and lose some when it comes to defending the creative decisions made along the way. 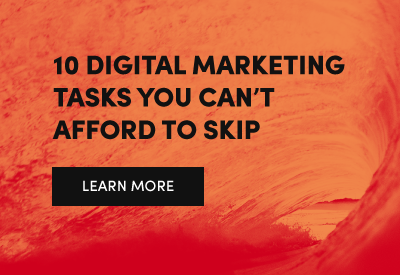 Your digital agency will have enough experience to know that everything can and will change throughout the process, so don’t get too attached to anything we’ve done. Boards or teams of executives can be fickle and are known to change their minds in the eleventh hour. Embrace the writing tip to “Kill your darlings.” Commiserate a bit with your account manager over that idea that you loved, bury it after a moment of grief, and then refocus on getting to the goal line. Working with a board, committee, or group of executives who aren’t involved in the day-to-day of a high-stakes project like a website or marketing program can be politically and mentally challenging. Your digital agency should have the tools, experience, and emotional intelligence to help you navigate the waters between creative ideation and approved execution.